While I was still wringing and hanging laundry on Rode Trip Brian, Matt, and Jessica gathered their fishing gear and headed out to get some supper. They explored some new reefs at Flamingo Cay and eventually returned to their starting grounds to pluck a few choice fish from the water. 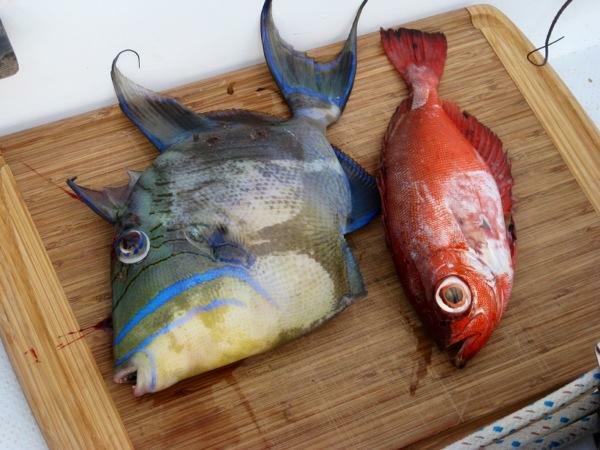 They returned with a variety of tasty entrees; trigger fish, glass eyed snapper, and lionfish. 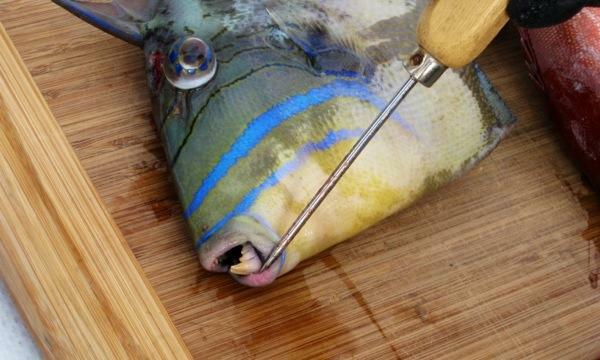 Look at the chompers on that trigger fish! This was the goofiest fish we’d seen. It also needed to be skinned, quite the process to sample this variety. But it sure was tasty! 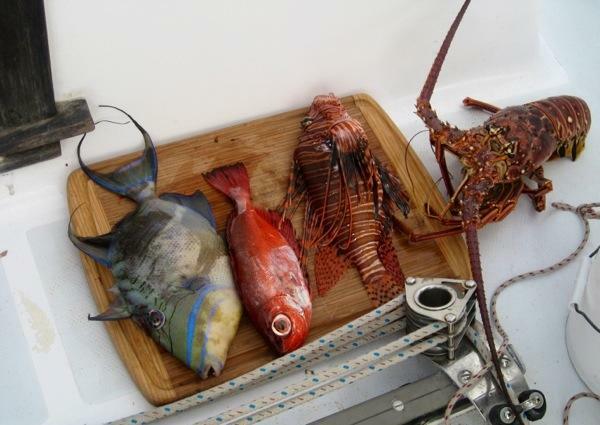 Here’s the line-up for dinner…hmmm, I’m not sure how that lobster got in the mix since lobster season ended. He must have jumped on board for the photo shoot. Jessica offered to host dinner on Serendipity. We’ve been pooling our fish and sides together to make joint meals and enjoy dinnertime together. 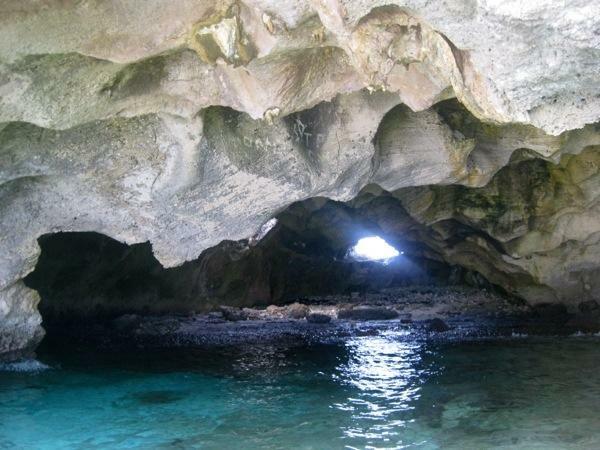 Before we shifted to dinner mode, however, we took a quick dinghy ride for a closer look at this cave. The end to another fabulous day and we all reminded ourselves that yes, this really is our life! This entry was posted in Uncategorized and tagged bahamas, flamingo cay, jumentos cays, lion fish, trigger fish by stephanie. Bookmark the permalink. I agree with Bahama Mama! I would like a few more details on how you are preparing these great catches. Looks like a lot of fun. Can’t wait to get out there. The chef is working on publicizing his secret recipes…thanks for asking! 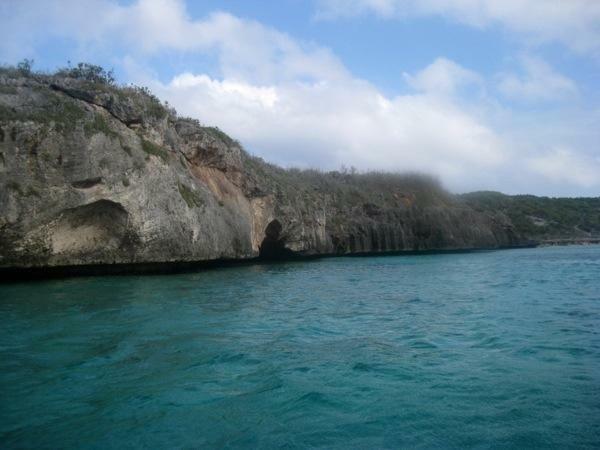 That stop at Flamingo Cay is still one of my favorites. Beautiful sights, great fishing, and great friends. Could you really ask for more on a trip like this? This work by Stephanie Grandjean is licensed under a Creative Commons Attribution-NonCommercial-NoDerivatives 4.0 International License.